Each of our community gardens provides participants with a space to grow, tools, water, compost, straw, common space and the knowledge and guidance of leadership committee members and the Garden City Harvest community gardens staff. With these resources, and a little bit of persistence and patience, gardeners cultivate food for their family (and often their friends, too). Gardens mean self-sufficiency, pride, and the taste of a homegrown tomato. If you’ve never had a plot with us, you will need to fill out an application by clicking the "Apply Here" button (below left) or print and mail the application to our office (download form here). We usually get more applications than we have garden plots, so gardeners will be selected by lottery and desired garden location after March 18, 2019. Each garden plot requires a $20 deposit. Annual fees are $40 for a full plot and $30 for a half plot. We also offer payment plan and scholarship options. Interested in renting a garden plot? Our spring application period has closed, but applicants can still be put on the wait list for the 2019 season. Anyone who does not receive a plot this season will have a higher chance next season! *Please only one application per household. We have 10 community gardens! 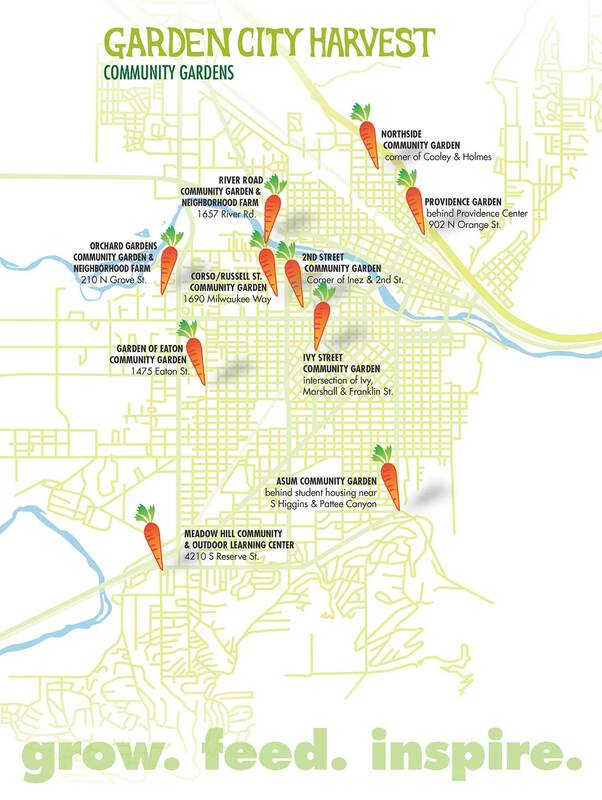 View our list of community gardens with links to maps for each location. View a Google Overview Map of the gardens or our simple GCH Garden Map. A garden plot is a commitment of time and consistent effort at least 7 months out of the year. A community garden is also a shared space. Gardeners not only take care of their own garden plots but are also required to contribute at least three hours per season to help maintain the common areas. Check out our contract and rules below to see if this is a good fit for you! While you might not get a plot in the first year you apply, we keep an active waiting list that we work through the entire season. If you do not receive a plot the first season, you’ll be given priority the following growing season. Feel free to contact us if you have questions about where your application stands. We are always looking for some extra helping hands! To volunteer at one of the community gardens, email Emily (emily@gardencityharvest.org) or give us a call! (406) 523-3663. If you are a community gardener, join your garden's leadership committee! Deadline to claim plot for 2019 season is March 1st! Note: We need to receive an email or verbal confirmation in order to secure your plot for the next growing season. Please do not reapply for a plot next season, just email Emily (emily@gardencityharvest.org) or call 406-523-3663 to let us know you are coming back. Please also make sure we have your current contact information so we can touch base with you about plot payments and Opening Day. We have a limited number of scholarships available which provide a full or partial waiver of the plot rental fee. Recipients must still pay the $20 plot deposit, which will be refunded after Closing Day in October if the plot has been cleaned and winterized. To apply for a scholarship, download the online form and email a completed copy to emily@gardencityharvest.org or drop it by our office. Scholarship applications are due by Friday, April 5, 2019.